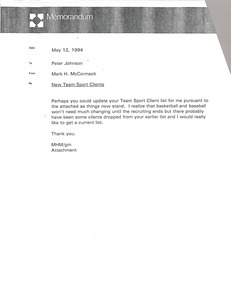 Concerning the attached, McCormack asks Johnson to update his Team Sport Client list. McCormack asked her to pass along the attached regarding Nick Buoniconti. The attached says IMG was able to help Mr. Buoniconti determine athletes that could be honored at his charity event. Johnson writes to request a memo be sent to Mike Barnett regarding submitting income projections on a timely basis. McCormack responds that he will do so, and also critiques the general indifference toward submitting income projections. Would like him to look into possibly hiring the Russian speaking intern that McCormack met, since there seems to be a rise in activities in Russia. McCormack discusses a plan to implement a more favorable expense recoup policy in regards to clients, in situations where the client seeks IMG's assistance, but IMG is not paid due to the nature of their representation agreement. 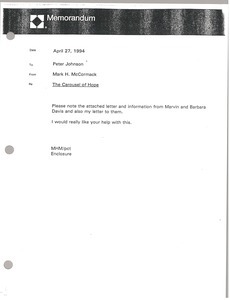 Concerning the attached correspondence between McCormack and Barbara and Marvin Davis, regarding the Davis' request for help in inviting athletes to the Carousel of Hope event in 1994 to raise money for the Children's Diabetes Foundation. McCormack asks Johnson for his help with this charity. 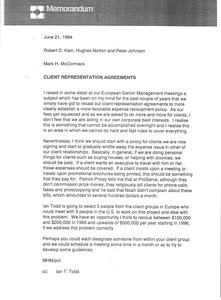 In regards to the attached letter from Ray Cave, McCormack would like Peter Johnson to wait until they can discuss the letter before moving forward with the IMG newsletter. In the attached letter, Ray Cave offers feedback on the newsletter and tells him how he could improve it. McCormack wanted Laurie Roggenburk to pass along the attached memo about how IMG was able to help Nick Buoniconti figure out who they would honor for a charity. Regarding the attached memo, McCormack would like him to look into the issue with Michael Barnett not submitting his expense reports. Regarding the attached resume from Mark D. Wolf, McCormack is asking if Peter Johnson or Casey Close should talk to him.